The Ebola crisis in West Africa has proved to be a moment of reckoning for Tony Blair's Africa Governance Initiative. Last summer, while dozens of international nongovernmental organizations were evacuating their workers from the countries affected by the outbreak, AGI staffers were holed up in London for the annual summer gathering. To have been part of the exodus would have been an understandable move. After all, the charity's focus is governance and, until July 2014, its advisers embedded in Sierra Leone and Liberia were focused on the countries' economic development, not health services. Yet, after much reflection on AGI's "values-driven" culture, staff members agreed they should return to the front lines to be part of the fight. As the organization's CEO Nick Thompson explained, the crisis forced AGI to reflect on how to demonstrate its values in its practice. "It led to us saying, 'We should be in this because we are committed to the countries and because this is the single-biggest issue they are facing,'" he said. "The things that we consider day to day around leadership, coordination, management and organization are as much a part of this story as the doctors and nurses on the front line." As a result, over a three-week period, the organization pivoted its efforts toward addressing the management of the Ebola crisis. In-country staff shifted to assisting governments in Sierra Leone, Liberia and Guinea toward improving their central coordination mechanisms. Advisers supported the design and management of effective district control centers in order to help the countries struck by the crisis to produce better and more reliable information that could inform decisions that are both critical to the success of the response and efforts post-Ebola. In Sierra Leone, for example, AGI supported the creation of a telephone "hotline" to help ordinary people receive the latest information on the virus. The situation room in the National Ebola Response Center is led by OB Sisay, who spoke of the value he gained from the organization's support. "Each member of my AGI team provides me capabilities that I would struggle to have otherwise — no matter how many other staff I have," he said. The mission of the U.K.-based charity, launched by the former British prime minister in 2008, is to make effective government a stronger part of Africa's good governance mix. Thompson explained that, working with leaders in six African countries, AGI's approach is to help heads of governments deliver on their priorities by building up the institutional capacity that surrounds them. Many of the organization's staff members are as likely to have a background in government as development. It's a factor that could account for the organization's distinctiveness, with AGI liking to think of itself as being a "learning organization" with a strong ability to adapt to changing situations and to learn quickly. In practice this means strengthening systems in order to create space for such agility. With just over 50 people working in six countries, the fundamentals to the organization's success are people, money, and trust and relationships on the ground. The skills of its staffers are a vital asset and the AGI head said he looks for a much broader range of softer, interpersonal and political skills than might usually be found in a typical technical assistance program. "We turn down a lot of people with great technical expertise because we don't think we can put them in these sorts of trusted environments," Thompson explained. This links back to why the values and culture at AGI enable the sort of reactivity and adaptability that it displayed in response to the Ebola crisis. "Decisions have to be made in-country," Thompson said. "I need people I can trust in-country and the most important thing is creating a culture that means I trust them to make the right decision." 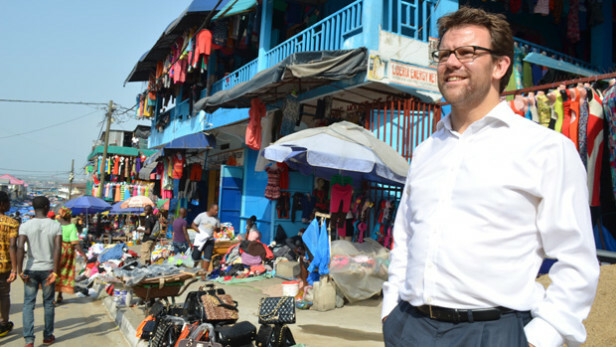 AGI receives funding from "traditional" donors, including the U.S. Agency for International Development and the World Bank, as well "more flexible" donors including the Howard G. Buffett Foundation, the Tony Elumelu Foundation, the Swedish Postcode Foundation, Humanity United and other private individuals. AGI was able to approach them with the request to redirect funds toward efforts in battling Ebola. And according to Thompson, almost all were content to continue funding the organization in its change of tack. But one notable absentee among the stellar list of AGI donors is the U.K. Department for International Development. In 2013 there were press reports claiming that U.K. Secretary of State for International Development Justine Greening had rejected the former prime minister's request for money to support the foundation's work. One member of Parliament was quoted stating, "With all the money he's made from consultancies, speeches and other work since quitting as prime minister, it is astonishing to see Tony Blair asking for taxpayers' cash." Thompson declined to enter into discussion on the veracity of the reports, but confirmed that AGI does not currently receive DfID funding. Instead, the CEO preferred to talk about AGI's funding strategy and emphasized that the current funding mix has worked to AGI's advantage. "Hypothetically, we could have funded the sort of work that we were doing in the first half of the year through, say, a World Bank agriculture program," Thompson said. "We didn't, but for the sake of argument we could have done so. It is very unlikely that we could have used that money to support Ebola." The charity is currently scaling up its teams in Sierra Leone and Liberia, two of the countries hit hardest by the Ebola crisis. From the outset, however, Thompson has believed that AGI will play an even more meaningful role in the post-Ebola recovery period than during the crisis itself. The challenge of defining priorities and helping governments maintain clarity, he said, will be critical to the success of its work going forward. "An interesting challenge will be to maintain the systems that have been built, the focus that has been put into them, the energy and the drive in the recovery as we have in the crisis," he said. "The thing about a crisis is that it's very clear what you need to do. It's when you take out that clarity that government systems tend to slow down." And so will AGI's Ebola pivot prompt it to change its focus more broadly, away from its flagship work around governance? For now at least, according to an AGI insider, its focus remains firmly on making government work for the world's poorest people. "I think the lessons we have learned in the last six years only serve to highlight how crucial that is for long-term development — whether it's in a time of crisis or a time of 'peace,'" the source said. "In fact, one of the lessons we're seeing from Ebola is that all development partners can be more effective if they're government led." What is your take on AGI's Ebola response? How important is it for implementers to remain agile? Have your say by leaving a comment below.